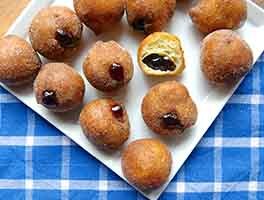 The moist texture and robust pumpkin flavor of these bite-sized doughnuts make them a fun, shareable, baked (not fried) breakfast treat. We find them especially delightful when dipped in either our chocolate glaze or cider glaze. 30 to 32 doughnut holes. Preheat the oven to 350°F. Lightly grease the top and bottom parts of a doughnut hole pan (see "tips," below, for a substitute pan). Beat together the butter, eggs, sugar, pumpkin, spice, salt, and baking powder until smooth. Spoon the batter evenly into the bottom part of the prepared pan, filling the cups almost full - a heaping teaspoon cookie scoop works well here. Lock the top part of the pan in place using the clips. Bake the doughnuts for 10 minutes, or until a tester inserted into the center of one comes out clean. Allow the pan to cool slightly, then remove the clips and the top. 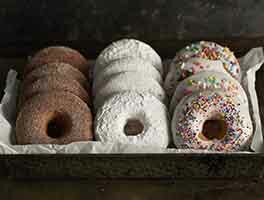 Loosen the edges of the doughnuts if necessary, and gently turn them onto a rack to cool briefly. Grease the pan again, and bake as many more batches as necessary to use up the batter. For sugar-coated doughnut holes, roll them in your preferred sugar while still warm. For glazed doughnut holes, roll them in glaze once they’re completely cool. Yield: 30 to 32 doughnut holes. If you don't have pumpkin pie spice, substitute 3/4 teaspoon ground cinnamon plus a heaping 1/4 teaspoon each ground nutmeg and ground ginger. If you don't have a doughnut hole pan, a mini muffin pan works well. Spoon the batter into the greased mini-muffin cups, and bake in a preheated 425°F oven for 10 minutes. These turned out great, very moist and tender. I used flax eggs in place of chicken eggs and 50/50 WW and AP flour. These taste like sweet cornbread when not glazed. I followed the recipe exactly and did not overmix. Just barely stirred in the flour. 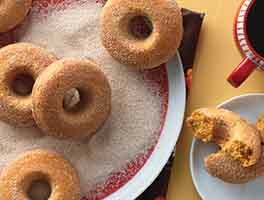 I will try the other pumpkin cake doughnut recipe on the site. I bought the adorable pumpkin hole 2 piece pan from Nordicware and followed the recipe included inside the pan. I could not get these things to cook. The oven temp was set at 350 and tested with a thermometer. It said to bake each batch for 10 min. but it took almost 40 min per tray. This ended up being an all night affair and they didn't even look like pumpkins when they were done. I brought them to work and no one would eat them. They would take a bite and spit them out with the comment that they were so dry they were hard to swallow. I love the pan but it would be just as easy to make these in little balls. I also found , as did another reviewer, that the cinnamon sugar did not stick to them. I think I am going to stick to a pumpkin bar recipe with cream cheese icing, with a lighter texture. These turned out great! I made mini muffins. They are easy to make. I did not even get my mixer out. I did use King Arthur Unbleached Flour instead of the flour recommended. I will make them again. I think these are great for being whole wheat! All 3 of my kids were audibly enjoying them while eating LOL. I used my standard size donut pan and got 1 dozen. I did not frost them. That's why I gave 5 stars...no frosting and kids love them! Tastes fabulous, even if you serve them without glaze. Love the fact that they're made using white-whole wheat flour! I made these with a standard doughnut pan, because I didn't want to stand there making batch after batch of doughnut holes. 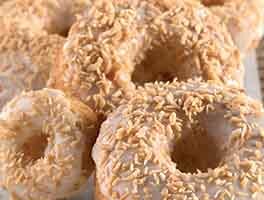 The recipe made a baker's dozen regular-sized doughnuts. I have WW bread flour. Will that work or no? If I only have AP flour, is the ratio 1 to 1?